E.L.F is one of my favourite drugstore brands, and when I'm in the states I always head down to target to check out their display. When in the UK, I still love using their website to stock up of essentials. I should really do a post on what I consider to be the best ELF finds, but until then I wanted to share with you this amazing Highlighter and Concealer, a great two in one product. Being a flight attendant, my eyes are often tired. Very tired. Sometimes, I feel no amount of under eye camouflage can cover up an 11 hour night flight from Vegas, but this almost miraculously does the trick. What I love most about this product is that the concealer side is totally matt. It's creamy and thick enough to cover under eye circles and blemishes elsewhere on the face, so it's a good multi purpose concealer. The highlighter is white based with a pearlescent glow, which reminds me of Benefit's Moonbeam. It can be added to the concealer for a light reflecting quality, or used separately to enhance the cheekbones or down the bridge of the nose etc. 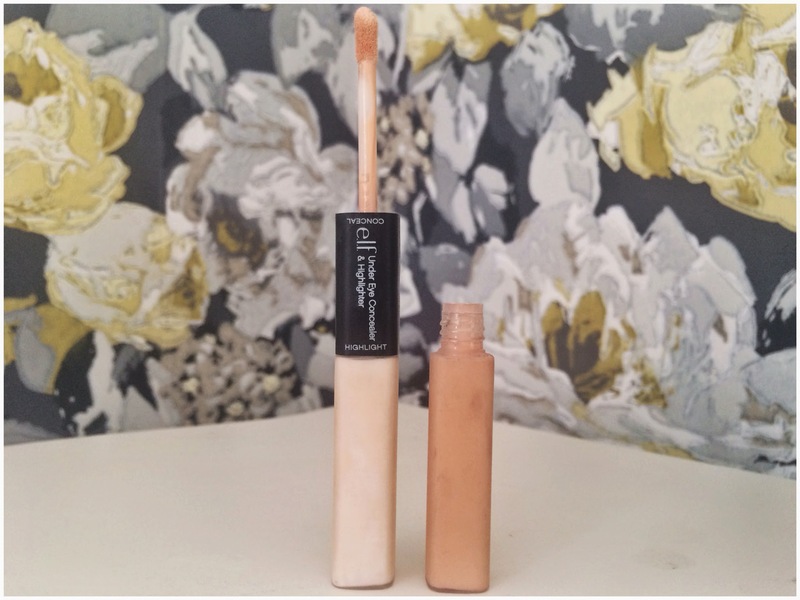 I usually like to carry a matt concealer to cover blemishes and a light reflecting concealer, but this product means I'm actually able to adapt it to multi uses and this has been saving a lot of room in my makeup bag - especially when I am travelling. The only downside is it isn't particularly long wearing on my skin, so I find setting with a translucent powder works the best, but then I usually set concealer anyway so it's no biggie. I think I paid around $4.00 for this in the states, and the UK website lists it as £3.95 which is still an absolute steal for such so amazing product, especially when bearing in mind that your actually getting two products in one! Next time you place an order with ELF, make sure you check this out! If it helps me look less like a zombie flight attendant, imagine what it could do for your skin! I can relate to tired eyes, concealer is a must! Does it settle into fine lines? Ohhhh I'm not sure I've actually tried any ELF brow products.... Il have to check them out! I've been checking out the elf website and I'll be sure to add this to my basket! I'm obsessed with the ELF website, it's pretty dangerous!